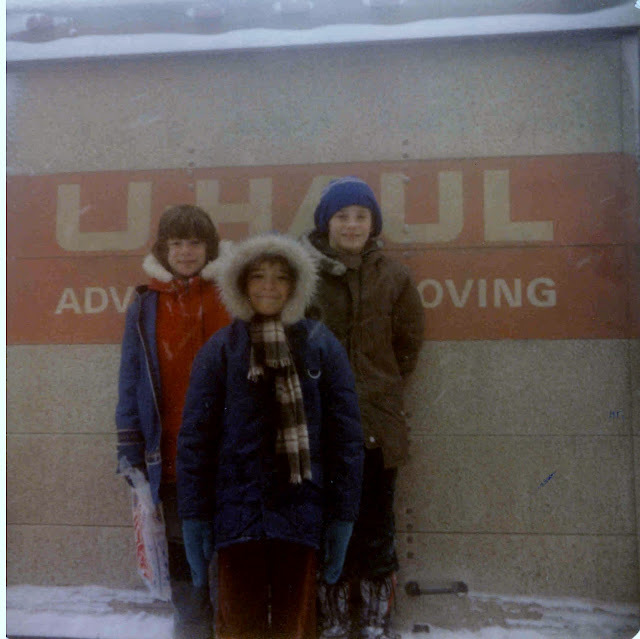 In March 1979, the Woods family packed up a U-Haul and left our home in Leaf Rapids, Manitoba to embark on the long journey to Edmonton, Alberta. Kelly Bear and Dave Doran, my best friends in Leaf Rapids, showed up just before departure to pose for this farewell photo. Kelly and I shared a love of Star Wars and Battlestar Galactica; we loved all things science fiction, really. I remember listening to soundtrack and otherwise SF-themed albums over at his place - the trippy Meco disco version of the Star Wars theme, Close Encounters, and even Boney M.'s Night Flight to Venus. Dave and I were both into the Micronauts toys; I remember being jealous of his giant Biotron figure. He was also the first to tell me about the "mirror mirror on the door, I wish my balls would touch the floor" joke - a little ribald for an 8 year old, and I didn't really get it, but of course I laughed like I understood the punchline. I was pretty devastated when my parents broke the news that we were moving. We were just leaving the Town Centre, the indoor mall that served as Leaf Rapids' community hub. It was dark, and I believe it was Dad who gently informed me of the new situation. I wheeled about in a blind rage and wound up burying my little fists in the midsection of an RCMP officer who'd been walking behind us. He graciously yelped out a "Whoa there!" and returned me to the custody of my parents. Embarrassed, I quieted down, but I was heartbroken. Leaf Rapids was home; all my friends were here, all my secret places were here. It seemed utterly unfair that I had to leave it all behind. Of course my parents were right to move to Edmonton, with its far vaster spectrum of opportunity. Had they not, I would never have wound up serving as a CBC television host (however briefly) or speechwriter to two Lieutenants-Governor and three Leaders of the Official Opposition. I wouldn't have met my new(er), enduring group of friends, or, most importantly, Sylvia. Could I have prospered as much or more had we stayed in northern Manitoba? I suspect not. I probably would have attended university in Winnipeg, but if the job situation in the early 90s was bad in Alberta, it must have been worse in Manitoba. It may have taken me even longer to make writing my career. Everything would have been different. Oddly enough, Dave wound up moving to Leduc not long after we did, and while we met once or twice, the friendship was never rekindled. I ran into Kelly (or Kelvin, as he styles himself now) via ICQ about ten years ago; we chatted briefly to catch up, and I haven't heard from him since. He seemed happy though, working in law enforcement, married with children. Sometimes I still miss Leaf Rapids, which I suppose is obvious given how often I've written about the place. But in truth, I have few regrets. We learn and grow by taking chances and making hard choices. Mom and Dad did it back in 1979, and I'm grateful. Moving on is important.